Why is it a Great Gift ? : The Nuts and Stuff Goodie Tower is a delicious gift, full of chocolate and nut candies stacked in decorated and attractive. Its an ideal gift - anytime of the year, for no occasion or for any and all occasions. 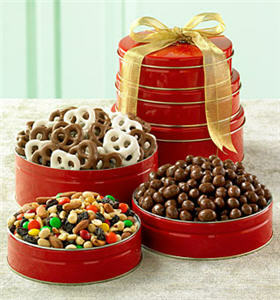 Plus, the colorful tins can be used as wonderful keepsake containers. Send one today ! * Small tin contains a trail mix loaded with nuts and chocolate candies. Due to availability, container color may vary.